Ever since I can remember, I have been a peanut butter lover; my history of having a peanut butter sandwich every day for lunch in high school can attest to this. 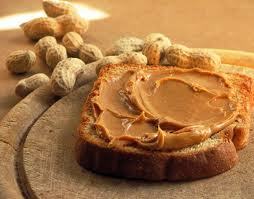 So when I recently discovered a new type of peanut butter on the shelves, Jif omega-3, I thought I would give it a try. It turns out that it became my new favorite kind, and effectively converted me from my Skippy allegiance. However, my new habit of eating Jif omega-3 has made me start wondering, why the sudden hype over omega-3 fatty acids, namely the EPA and DHA varieties that have been added to the peanut butter? What are they actually doing for my health? Well, the label on the jar failed to offer up any answers at all, so I was prompted to visit Jif’s website in search of some basic facts about omega-3s. Once again, I was disappointed to find no information. Fortunately, I found that Smart Balance’s website had a plethora of facts and claims about omega-3s from registered dieticians. Specifically, Willow Jarosh, R.D., and Stephanie Clarke, R.D., claim the main benefits of omega-3s are that they “can help support cardiovascular health, healthy brain function and overall health”. This turned out to be a very vague and unsatisfactory answer. 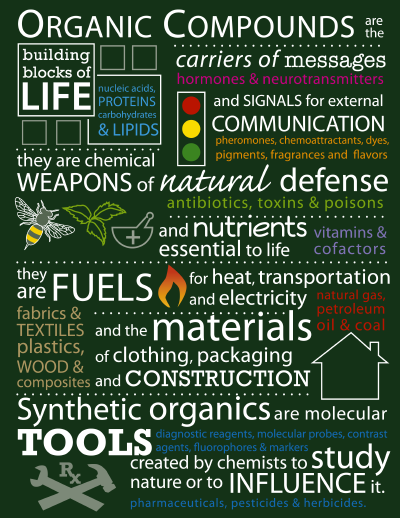 First and foremost, what does overall health consist of? What does “health” mean in this context? How do these fatty acids yield these benefits? The explanation failed to explain these matters in depth. Figure 1. 3-dimensional view of the alpha-linolenic acid molecule (ALA). Figure 1. A structural view of eicosapentaenoic acid (EPA). Figure 1. A structural view of docosahexaenoic acid (DHA). Fortunately for me, many studies have been conducted on these compounds, and the findings are easily accessible on the internet. Because the benefits of omega-3s that the peanut butter companies described were rather diverse, I decided to research each major benefit separately and seek to understand the physical mechanism that explains how the compounds create this reaction. First, I looked at the benefit of healthy brain function. Once I started reading the results of my Google Scholar search, I noticed that this could better be described as mental health wellness. According to Riediger, the omega-3s can help combat the onset of various mental health conditions, including ADHD, depression, and dementia or Alzheimer’s. Although we always hear that the brain is made of mostly water, the composition of the actual brain tissue is incredibly phospholipid-rich. Omega-3 fatty acids serve an important role in maintaining membrane fluidity. This is essential for binding compounds such as ligands, which then enables the brain to undergo signal transduction processes (Riediger, 2009). In addition, omega-3s seem to play a role in the production of various neurotransmitters, including serotonin. So what does all of this translate into? It turns out that the increased production of dopamine and serotonin helps explain the omega-3 fatty acid link to ADHD and depression. Our brains are highly fat-dependent, and the cell membranes of neurons are made from these essential omega-3 fatty acids, in particular the alpha-linoleic acids (ALA). This helps keep the brain fluid, allowing neurotransmitters to send signals via chemical pathways in order to regulate hormone levels. 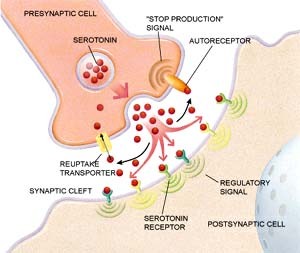 The serotonin pathway is one of the major pathways involved in mood regulation, and it is greatly affected by the brain’s ability to send and receive messages. In this pathway, the end of the axon of the nerve releases bundles of serotonin molecules into the synapse. The molecules can then either be taken up by receptors of the next nerve cell or taken back up by the original nerve cell that released it if quantities are too high. Looking at the molecular level of the processes going on, the effects of omega-3s on so-called “brain health” are starting to make sense. Basically, more omega-3 fatty acids means better neural communication within the brain, leading to mood stability and increased memory function. The current patterns of a decrease in the amount of omega-3s in our diet appear to be correlated with the increase in the prevalence of mental health disorders. In fact, depression is estimated to be the second highest cause of disability within the next fifteen years. Maybe people really should be more serious about incorporating sources of omega-3s into their daily diets. Many researchers have discovered the benefits of adding omega-3s to children’s diets, as displays of disruptive behaviors were noticeably decreased with increased omega-3 levels. This appears to be associated with omega-3 fatty acids’ link to brain development. Children suffering from ADHD tend to have brains that are 3 to 4 times smaller in volume than normal brains (Ottoboni, 2003). The decrease in gray matter in the brain is thought to be linked to cognitive deficits, which may be part of the cause for the children’s ADHD. Stevens et al. conducted an experiment where fifty children where randomly placed in two treatment groups: one receiving a supplement complete with 480 mg of DHA and 80 mg of EPA, and the other receiving an olive oil placebo. After four months, they found a substantial increase in the amount of EPA and DHA in the plasma phospholipids, as well as red blood cell lipids (Stevens, 2003). This shows that dietary DHA and EPA successfully uptake into the brains of developing children, rather than passing through their bodies. Behaviorally, there was noticeable improvement in children’s behavior with the fatty acid treatment (as rated by their parents). However, the improvement was only significantly better than that of the olive oil treatment group in 2 of 16 outcome measures: conduct problems rated by parents (-42.7% versus -9.9%) and attention symptoms rated by teachers (-14.8% versus +3.4%). It is important to keep in mind that there may be outlying variables that can skew these results, such as the fact that the rating scale is completely subjective and is different for each person who rates the children. Because children’s brains continue to grow and develop well into their twenties, the effects of their diets continue to play an important role in brain functioning. Several studies have been conducted that confirm these proposals with some astonishing findings. It seems that in individuals with diverse mental health conditions, ranging from schizophrenia to ADHD, depression to dyslexia, low levels of plasma DHA have been found (Riediger, 2009). The range of effects of omega-3s on mental health is quite impressive, but taking into consideration the major role they play in brain composition and overall neural activity, it is not surprising. So it’s clear that omega-3s are important for healthy brain function, but how do they affect the heart? Studies from the American Heart Association have shown that the fish-derived varieties of omega-3s, EPA and DHA, have far-reaching cardiovascular benefits. In an informational pamphlet, the association makes several claims about their effects, including the decreased risk of arrhythmias (which may lead to sudden cardiac death), as well as decreased risk of thrombosis (which may lead to heart attack or stroke). However, the pamphlet did not go into detail with the science behind it all, so I was inclined to find out why these molecules are able to achieve these benefits. Upon further investigation, I discovered that EPA and DHA are the two types of omega-3s that act against the occurrence of arrhythmias, or abnormal heartbeats. 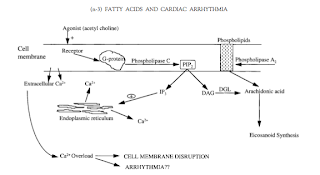 Two methods have been used to determine how omega-3s can have anti-arrhythmic effects. In the first, called the induced ischemia model, researchers induce a restriction of blood supply to tissues, causing oxygen shortages in the heart. They achieve this by blocking the coronary artery. McLennan et al. 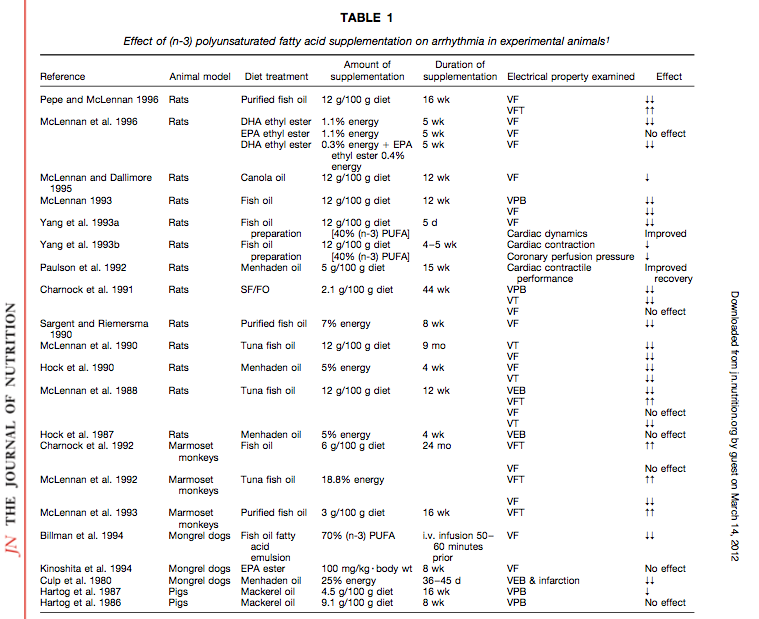 (1992) studied the effects in marmoset monkeys, and found an increase in the threshold required to induce ventricular fibrillation after the animals were fed a diet of sunflower seed oil or tuna fish oil (Nair, 1997). In the second method, called the ischemia-reperfusion model, researchers studied the effects of omega-3s after reperfusion arrhythmias, which arise when blood flow is restored to a region of the heart that had previously had blood flow cut off. Nettleton et al. 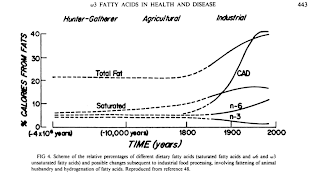 (1995) found that after rats were fed fish oil for four weeks, there was a significant decrease in the amount of fatal arrhythmias, as well as ischemic damage. In my research of omega-3s, I was bombarded with information about the molecular happenings that go on when one supplements their diets with them. This seems to be a very hot area of interest right now, and with all of the benefits and effects that they have throughout the body, it’s easy to see why. One could go on forever about all the hypothesized benefits that these compounds convey, as studies are constantly proposing new ideas or shooting down old ones. One thing is certain, however: I will definitely continue buying my Jif omega-3 peanut butter. And now, I have the satisfaction of knowing that it is doing my body good in more ways than I had ever even considered. Hu, F. B., Bronner, L., Willett, W. C., Stampfer, M. J., Rexrode, K. M., Albert, C. M., . . . Manson, J. A. E. (2002). Fish and omega-3 fatty acid intake and risk of coronary heart disease in women. JAMA: The Journal of the American Medical Association, 287(14), 1815-1821. Jarosh, Willow, R.D., and Stephanie Clarke, R.D. "Your Questions- Answered." Smart Balance. Healthcare Professionals, n.d. Web. 13 Mar. 2012. .
Nair, S. S. D., Leitch, J. W., Falconer, J., & Garg, M. L. (1997). Prevention of cardiac arrhythmia by dietary (n-3) polyunsaturated fatty acids and their mechanism of action. The Journal of Nutrition, 127(3), 383-393. Ottoboni, F., & Ottoboni, A. (2003). Can attention deficit-hyperactivity disorder result from nutritional deficiency. Journal of American Physicians and Surgeons, 8(2), 58-60. Riediger, N. D., Othman, R. A., Suh, M., & Moghadasian, M. H. (2009). 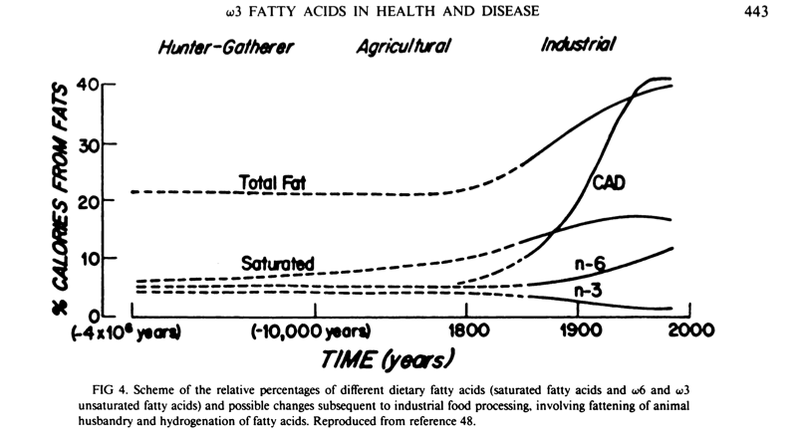 A systemic review of the roles of n-3 fatty acids in health and disease. Journal of the American Dietetic Association, 109(4), 668-679. Schimelpfening, Nancy. "The Chemistry of Depression." What Are Neurotransmitters. About.com, 19 Sept. 2011. Web. 13 Mar. 2012. .
Stevens, L., Zhang, W., Peck, L., Kuczek, T., Grevstad, N., Mahon, A., . . . Burgess, J. R. (2003). 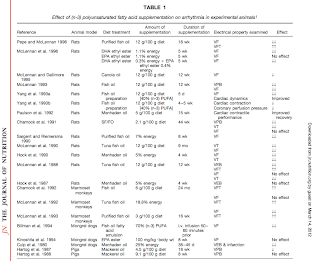 EFA supplementation in children with inattention, hyperactivity, and other disruptive behaviors. Lipids, 38(10), 1007-1021. Sarah, I really enjoyed your post because I am also a devout peanut-butter lover and have recently started buying the Jif Omega-3 brand as well. I wonder why Jif chose to use the type of omega-3 that they did? I know you mentioned that DHA and EPA both function similarly, but does ALA also comprise the same phospholipid membranes? Will eating only one type of Omega-3 cover all my bases in terms of cardiovascular and mental health? I think its very interesting that Omega-3s can play a role in increased levels of depression. Is there actual proof that lack of Omega-3s cause chemical imbalances in the brain? I'm just happy that peanut butter tastes as good as it does because I'm not a big fish eater so hopefully I will continue to get these benefits from Jif! Sarah, Great post. You did a good job ensuring your post flowed nicely and logically in a manner that wasn't too difficult to understand. I came to this post because I tend to eat a lot of fish, and your post about Omega-3s applied to me and seemed quite interesting. Everything seemed good except I am having a hard time believing one of the facts you posted in the article. "Children suffering from ADHD tend to have brains that are 3 to 4 times smaller in volume than normal brains" . I'll have to look at the research that you cited for that one but that seems way to farfetched to me. All in all, good post. I liked how you critically questioned something that affected your everyday life. Every product nowadays seems to be supplementing things in to "better our health" yet as to the reasons why or how are never explained. Good job delving through the bombardment of information.